It seems only yesterday I arrived to Nablus, yet the last three months have given me a lifetimes worth of fulfillment. Today being the final day of our summer session classes was very sentimental, as I said my goodbyes to students, aerobics moms, volunteers and translators. An infinite amount of hugs from my students and moms would still not have been enough, and the countless number of gifts I received will be keepsakes that I will hold on to forever. There is not much left to say besides that the people of Nablus have been incredibly welcoming, and their kindness and warmth will never been forgotten. My experience here has far surpassed what I had ever imagined, and for that I am eternally grateful to TYO and all those associated with it. Farewell my beloved, Palestine. I’ll be seeing you again soon, inshallah. Samin is a summer intern at TYO Nablus. It was a good week for my Creative Thinking class. Once an idealistic brainchild led by two terrified first-time TYO teachers, the pilot class is really starting to come into its own. Heading into the class eight weeks ago, one of my major goals was to convince our kids that sometimes, it’s totally fine to be wrong. Getting the right answer isn’t always the point; it’s the process of reasoning that refines our logic and molds us into lean, mean critical thinking machines. Being wrong about things is what makes us human – it’s the proverbial hand on the stove top or super hot pepper that your brother dared you to eat. It might not be your proudest moment, but being wrong is what makes us grow. To that end, I assigned a class project for which being right was victorious and being wrong was hilarious. The kids were each given a water balloon and told that in half an hour, we were dropping it off the roof. Their assignment was to create a protective barrier to prevent the balloon from breaking from the collision. After a solid three minutes of staring at their balloons and fighting every ounce of kid instinct telling them to forget the project throw it directly at their teacher, they got to work. What resulted was nothing short of a miracle. There were no squabbles over materials, no moments of frustration, no asking for the answers – just good old fashioned hard work. They squinted their eyes and pursed their lips as they taped pieces of cushion and foam and newspaper around their fragile balloons. A half hour later, it was show time. Only four kids out of two classes successfully protected their balloons from utter destruction, but it didn’t seem to matter. 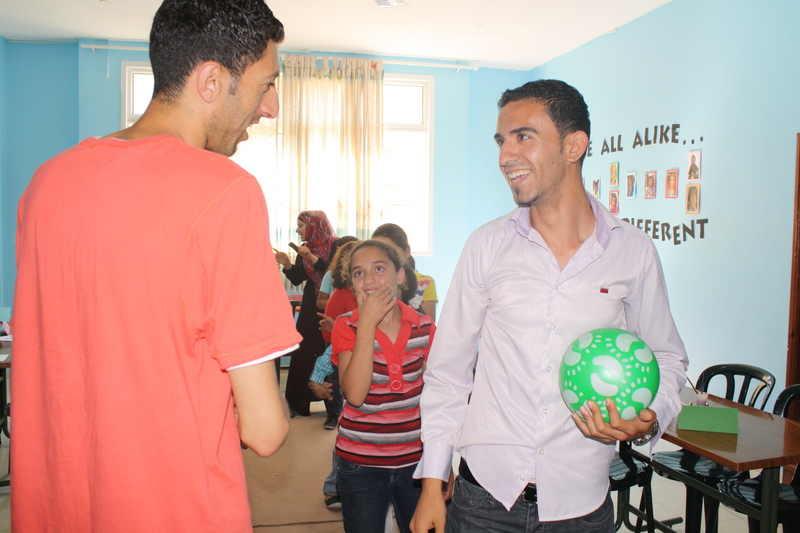 They laughed as volunteer Imad counted down from three before he released each kid’s creation. They laughed even harder when the balloons exploded all over me and my translator, Jamila. They smiled and shrugged when I held up the popped balloons with a grin, and four of them jumped up and down and hi-fived their friends while raising an dry, intact bundle triumphantly over their heads. When we got back to the room, we asked if they’d had fun. The answer was a resounding “Ah! Ah! Ah!” (kid translation: yes, we did.) The activity wasn’t about being right – it was about learning that sometimes failure is okay. Especially if it soaks your teacher with a water balloon. Me: Can you tell me a little about yourself –age, education, work, hobbies/passion, etc? Mutasim: My name is Mutasim. I am 23 years old, and studying English Literature at An Najah University. I like football, and spending time on the computer. Me: How long have you worked at TYO? Mutasim: I have been here for about 5 months, working as a volunteer and translator. In the Spring 2011 session I worked as Colin Powers’ (former intern) translator for homework help. This session, I helped translate for Colin during Soccer League, and with you in your summer camp English class. Me: What brought you here? Mutasim: There are not many job opportunities here for post graduates. I worked in a summer camp called “Holy Book” when I was 19, and really enjoyed it. I found that I like volunteer work and working with children very much. Me: What is keeping you here? Mutasim: I have lots of friends at TYO. I like to stay involved here because we are serving a lot of children in good ways. We can offer them more than just playing in the streets; instead they can spend time having fun in different ways in which they learn how to deal with other children and adults nicely. Also, can I say, I come because I like to improve my English [laughs]. Me: What is your schedule at TYO? Mutasim: I work from Sunday through Thursday, from about 11:00 am to 6:00 on Sunday and Monday, and 11:00 am to 5pm on Tuesdays, Wednesdays and Thursdays. Me: Wow, busy schedule. That’s great! Me: Do you have a big family/are you use to a lot of interaction with children? Mutasim: There are nine siblings including me, and I am the 7th in line. I live at home with my parents, but all of my other brothers and sisters are all over West Bank studying or working. I also have two brothers living in Pittsburgh, Pennsylvania, who I will visit, inshallah. I don’t have any very young siblings, but I do have nephews and nieces that I see sometimes. It’s a new idea for me to work with kids, but I enjoy it a lot because of their innocence. Me: How do you envision your life being without having TYO around? Mutasim: I would be wasting time. Here I feel I am doing something. Me: What influence has TYO had on you personally? Me: How do you feel the work you have been doing here has affected the children you work with? Mutasim: Sometimes I feel I can do a lot of things to help the children, but sometimes it’s frustrating to deal with naughtier children. This makes me want to stay even more because I want to continue practicing patience and helping children overcome their problems. I feel like I am doing something so good, and feel happy when the children like me and call me by my name, instead of Amo (Arabic for uncle meaning Mister) or something like that. They feel close to me. Me: What is your favorite part of TYO? Mutasim: Field days are good because it seems the work of TYO is expanding already through different parts of Nablus. And I also enjoy cleaning the parks because it makes me feel responsible. I feel I am doing something good for my country. Me: What is your hope for TYO in the future? Mutasim: I hope to see TYO extend to other cities like Ramallah, Jenin, and so on because I want to offer these great programs for children throughout Palestine. I also hope that they will continue adding other helpful programs for adults as well, inshallah. Me: How long will you stay with TYO? Mutasim: Until they become sick of me [laughs]. I hope that one day Mutasim’s hope for TYO’s extensive expansion becomes a reality, inshallah. It would be a privilege for us to have his continued support and involvement in TYO. I look forward to being witness to the mutual exchange of growth that one will provide to the other. My mom always says to bloom where you’re planted. It’s a cryptic life instruction; I think it’s somewhat akin to the superficially obvious unattributed quote, “Wherever you go, there you are.” Nearly a year ago, I left my friends and family in Los Angeles to pursue some sort of ambiguous higher calling. I never expected to wind up in Palestine. It’s amazing where a random email through your graduate school listserv can lead. I suppose we all wind up in unexpected places. These sometimes-serendipitous-sometimes-scary digressions frequently compose more of our lifetimes than the stuff we planned. And while it’s always experience, living impulsively is not always easy. I’ve recently been hit, as I think many TYO interns are at some point, with a wave of homesickness. Perhaps this was spurred on by blackberry season in Wooster, Ohio, the small midwestern town where I was born and raised. My mom’s blackberry pies are otherworldly. But something funny happened last weekend. Some of the interns went to Ramallah to sample exotic new flavors of iced coffee and explore another area of our new home in the West Bank. Upon our return to Nablus later in the evening, I flopped down in my room and listened to the confused rooster outside my window who starts to crow at 11pm. I walked out to the balcony to take in the Nabulsi breeze and fantasize about the kunafa I’d eat in excess the following day. It was good to be home. In that moment, I realized that unbeknownst to me, I had taken mom’s advice. I liked it here. Actually, I loved it here. I realized that Palestine had gotten into my blood, and perhaps it would be a little harder to leave than I originally anticipated. I still miss my family and friends – mom’s blackberry pie, my dad’s high pitched giggle when he plays with the dog, the dimples in my nephew’s cheeks when he does something his mother JUST told him not to do – but there are just as may things about Nablus that I’m going to miss when I’m gone. So, whether it’s the kunafa, little Rida’s subconscious habit of pushing his glasses up during a soccer game, the “secret hi-five” we have with the neighborhood girls, or the friendships I’ve made with the other interns, I’m going to spend the last three weeks here taking in every single moment of it. Well, maybe not the kunafa part – I’ll stick to every other day with that.